Over the past decade, alternative dispute resolution has become an alternative method of resolution utilized by a number of couples seeking to finalize the terms of their separation agreement, divorce or child custody agreement. 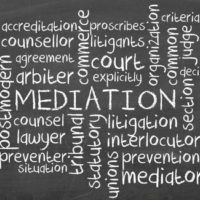 Mediation, a type of alternative dispute resolution method, has been approved by the judicial system as a method of settling child custody and divorce cases. Mediation, as well as arbitration, was approved as an alternative measure to settle family law cases, in response to the lengthy court docket process, which can leave a couple settling a case months to years after they originally entered the divorce decree process. In mediation, a neutral third party is employed to hear both spouses’ sides of the story, what issues are resolved and which still need to be worked on, as well as how they may settle the matter. Unlike arbitration where a final, legally binding decision is made at the end, a mediator will hear both parties and then make final suggestions to the spouses lawyers, who then will come up with a settlement agreement. Many people seek this type of dispute resolution as an alternative to litigation not only because it is more timely, but it is also much less expensive than traditional legal proceedings. Starting July 1, 2017, family law mediators in Wisconsin will now be able to draft settlement agreements after hearing the case. The Director of State Courts filed the petition on the recommendation of the Wisconsin Supreme Court’s Planning and Policy Advisory Committee, which was nearly unanimously supported. The support for this alternative dispute resolution tactic was in response to nearly 70% of divorce proceedings being self represented, due to the high cost of hiring a family law lawyer. Of those cases that have unrepresented parties, 95% of those settle outside of court. While settling outside of court is beneficial, many self represented parties do not understand the process of submitting proper documentation and as well as some of the formalities of finalizing a divorce. Having a mediator draft a settlement agreement now allows parties to have that informal process with a legal professional, at a much lower cost. Contact the experienced Texas lawyers at Lindamood & Robinson, P.C. today so we can begin working on your case.